An invitation for a tourist visa — is a unified confirmation, which can be accompanied by a tourist voucher indicating the program of stay. When filling in the visa application form, specify the purpose of the visit - tourism. To submit documents to the Consulate, a copy of the invitation is sufficient. I ordered visa invitation and got it already after few minutes after payment. After that I provided documents in to Russian Embassy in Copenhagen and got a visa. Thank you guys for your service! Now going to Russia got much easier. Always excellent and timely service. Me and my family found the web page MyVisaToRussia.com very reliable and we had a great time in Russia.Thank you and wish you further success in doing your business! 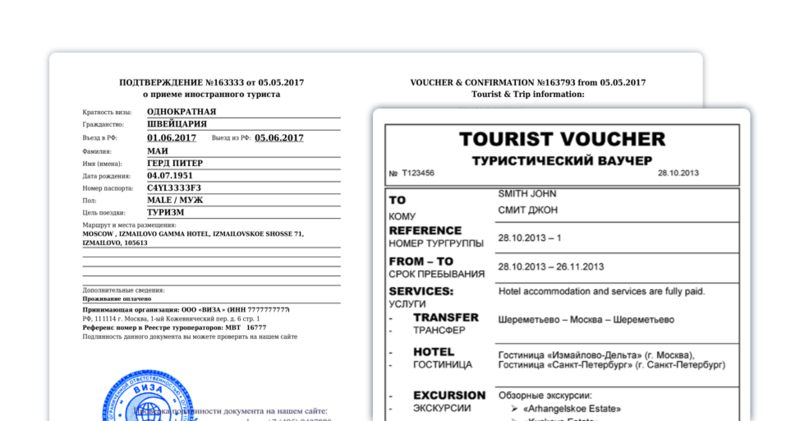 I used MyVisaToRussia.com services, got the invitation for the tourist trip by e-mail. I printed it out, applied to the Russian consulate in Latvia and obtained a Russian visa. It all works just the way described on the web! Thanks for your consultation with filling out visa profile on the MFA web!